Mundesley beach01263 513811work BeachMundesley beach is backed by a raised promenade lined with colourful wooden beach huts. Cliffs form the backdrop to the beach with pretty cliff top gardens where visitors can shelter and sit. In the clifftop gardens is the Mundesley Maritime Museum which is believed to be the smallest museum in the UK. Today it is used as a Coastguard Watch manned by volunteers. It is open everyday from May to September and closed on Saturday. Next to the museum is the monument set up in memory of the Royal Engineer Bomb Disposal Personnel who were killed clearing British landmines along the Norfolk coast between 1944 and 1953. •	The promenade consists of a hard pave surface extending 592 metres from East to West. •	Railings span the full length of the promenade with steps down to the beach . •	Beach huts can be hired throughout the season. •	The main access point to the beach is from the cliff top gardens. •	There are RNLI Lifeguards on the beach from May-September from 10am - 6pm daily. •	If you would like a barbeque party on the beach written permission from North Norfolk District Council is required. 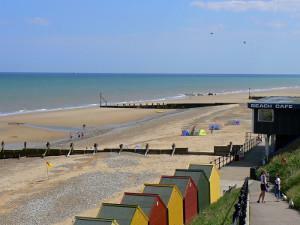 Mundesley beach is backed by a raised promenade lined with colourful wooden beach huts. Cliffs form the backdrop to the beach with pretty cliff top gardens where visitors can shelter and sit. In the clifftop gardens is the Mundesley Maritime Museum which is believed to be the smallest museum in the UK. Today it is used as a Coastguard Watch manned by volunteers. It is open everyday from May to September and closed on Saturday.